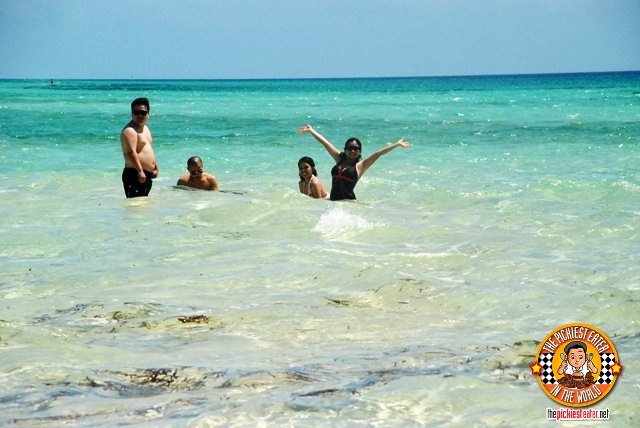 One of the perks of living in Cebu when I was a kid was the beach. Because of my family's business, we were fortunate enough to be able to go to the beach as easily as people in Manila decide to go to Mega Mall.. almost to the point of me getting sick of it when I was a kid. Sure it was fun at first, but like everything in life, (and especially when you're a kid) when something becomes a weekly routine, it gets tiresome. One morning, I had just gotten out of bed, my dad told me to get ready because we were going to the beach. I rolled my eyes and said I didn't want to go. My dad, you see, is a lover of anything to do with the seas, so he was a little bit shocked. He said, "Come on, we're going to go island hopping on a pump boat." Being the brat that I was, I found it funny he thought that would entice me, considering that's exactly what we would always do when we go to the beach. I said I wasn't feeling well. Then he said, "Do you know how to fly a kite? The wind looks nice out. I could teach you." Being a punk 13 year that was trying to reach the highest level of Castlevania on my Nintendo Family computer, I found his offer to fly a kite laughable. I said a simple, "No Thanks". He then looked at me and said, "Richie, believe me, one day you're going to miss the beach and going island hopping." Finally I just annoyingly said, "I have a lot of homework to do, Dad." He didn't look to happy, but he obviously got the message. I know he told my mom what I said because before they left, my mom said, "I'm going to check your homework when I get back so it better be done". So I got out of having to go to the beach that weekend, which for some reason I took as a form of punishment, and instead spent the day on a whole lot of video games and a little homework. Cut to: Twenty years later. When Rina told me that her sister, Chaikka, and her Boyfriend Don wanted to the beach for Holy Week, there was only one place I could suggest.. Cebu. I needed to get out of the concrete jungle that is Makati so we booked the flights without hesitation, and luckily enough, my friends Ted and Karen were able to join us as well! Given all my years living in Cebu, my group looked at me as "The Host", so naturally I was in charge of fixing the itinerary. 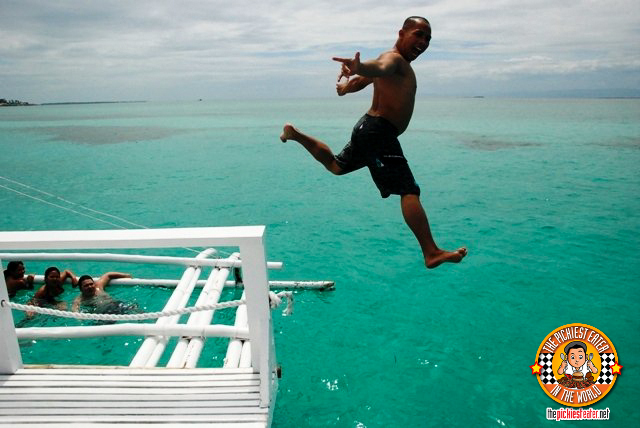 I could easily book a pump boat for island hopping, but I wanted to give my friends an experience that they couldn't get just anywhere.. something that would be distinctly "Cebu". That's when my brother told me about Islands Banca Cruises, which he had experienced with his friends a couple of months before. So I booked the cruise, and we headed off to Cebu. My dad was already there, attending to the business, but welcomed us all when we arrived. He asked me if we had a set itinerary yet, and I said we had booked a few plans. And as proof that God has a sense of humor, I said to my dad for the first time in my entire life.. "Dad, we're going Island Hopping tomorrow. Would you like to join us?" My dad smiled and said, "Sure". Don't get me wrong, its not like we haven't gone island hopping together since that fateful day I declined his offer. It's just that, this was the ultimate realization of what he said was true. I missed being able to go to the beach at a moment's notice. I missed being able to go hopping from island to island. I missed Cebu. You dock at the Islands Banca office Near Cebu Hilton, but I must warn you, their office wasn't really much to look at when I was there. Mainly because clients aren't really going to be staying there anyway. Before we set sail, the "Captain" gives us a rundown of the ground rules of the boat. Rina found the Captain's effort to memorize the spiel in English was absolutely adorable. The staff was courteous and attentive, always making sure our needs were met. One of the first things they asked for was if any of us had an iPod, which they immediately hooked up to the boat's sound system. 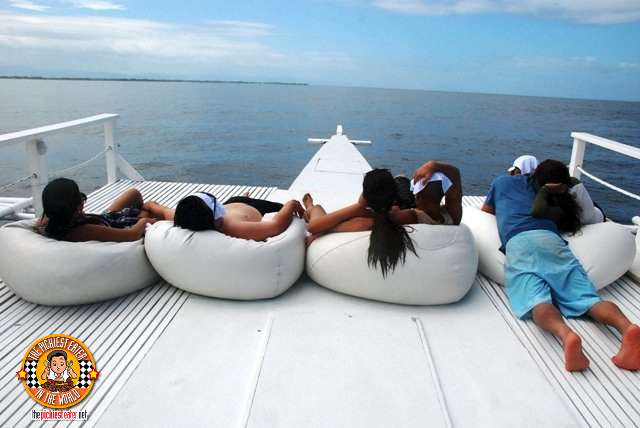 bean bag chairs at the center of the boat. Though there were only seven of us in our group, the package we got was for the the "Bariles" Boat, that is actually meant for 15 to 20 people. There's actually a smaller boat called the "Butete" boat which holds 10 to 15 pax, but there's hardly any difference from an ordinary pump boat (aside from it being much cleaner). 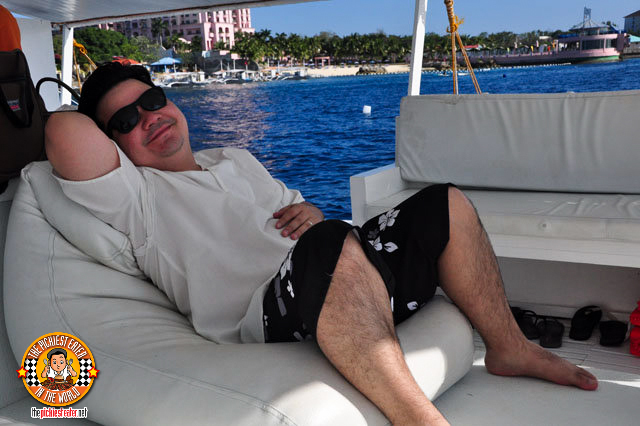 If you want the full Islands Banca Cruises experience, I STRONGLY suggest not settling for anything less than the Bariles. Beside, from the name alone, "Bariles" sounds a billion times cooler than "Butete", right? With the Bariles Boat, no longer is the boat so cramped, and you have to watch your step, lest you trip over some rope or snorkels or something. Everything is cleared and the the floor's deck is flattened out to one level, giving you the feeling that you're on a yacht. 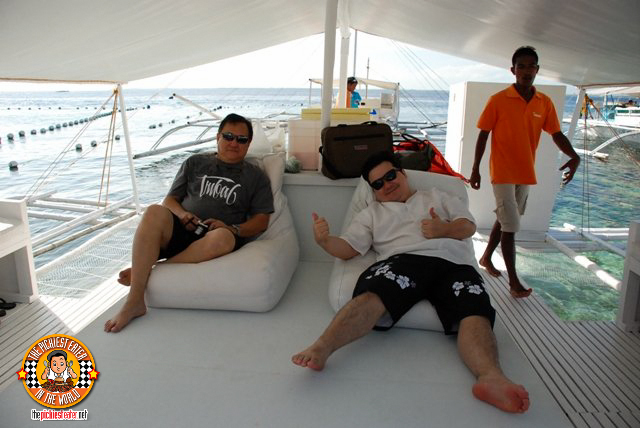 The bamboo benches facing each other that you would usually sit on in a normal banca are now lined with cushions, and bean bags are scattered all over the deck, to help add to the added feeling of luxury and comfort. We selected Pandanon Island as our destination. 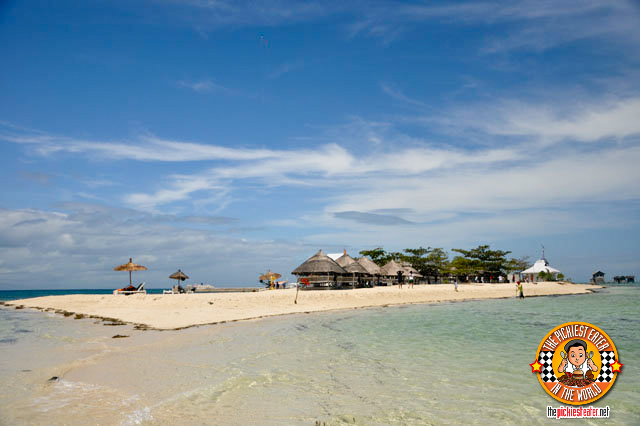 It's actually a small sand bar off the coast of Mactan. We were advised to go a little bit early because the small cabanas are usually in high demand, and there were only a limited number available. The beach itself might not have been filled with powdery soft sand like Boracay's but it was still breathtaking. Since it was a Sand Bar, it seemed like no matter how far from the shore we walked, the water couldn't go past our waist level. I actually had a little surprise for my dad. The day before we went on the Banca Cruise, we did a little tour of the city. I saw a guy on the street selling kites and ended up buying a cheap one. 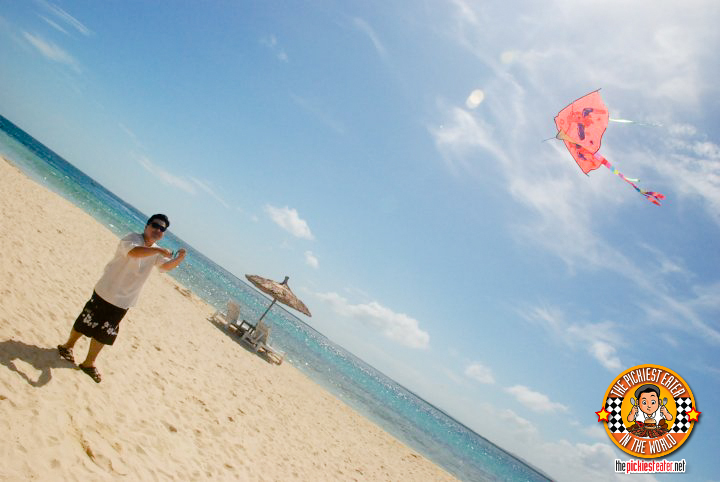 After we did a little swimming and the wind began to pick up, I brought out the kite and began my attempt to fly it. Unfortunately, I realized I had never actually done it before, so I had difficulty getting it to fly.. Much to the delight of Rina and the gang. My father walked up to me rather amused, and said with a laugh so Rina and my friends could hear, "I'm sorry, Richie. I think I forgot to teach you how to fly a kite when you were a kid!" Obviously he didn't remember the incident in which I rebuffed his attempt to teach me, so I just laughed along as well. It may have come twenty years later, but nevertheless, that's how my dad taught me how to fly a kite. Lo and Behold, with the help of my dad, I actually got that sucker quite high up into the air, except my string wasn't long enough (It went much higher than seen in the picture, mind you). 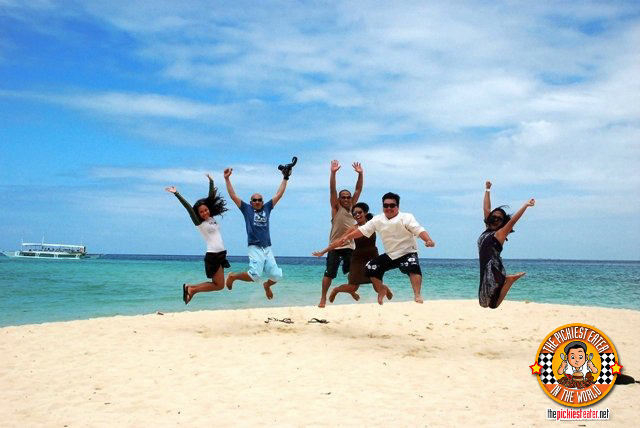 As per Rina, you can't go to the beach without a jump shot, and this was ours. Unfortunately I'm the only one that looks like he's sitting on the toilet. Since we had time to spare on our clock, The Captain asked if we were interested in going for a swim in the middle of the ocean. Everyone was a little bit wary but I jumped up and said "Hell Yes!!" We found a nice spot where the water is light green and you can see the bottom of the sea, but deep enough to jump into without having to worry about your feet hitting the seabed. 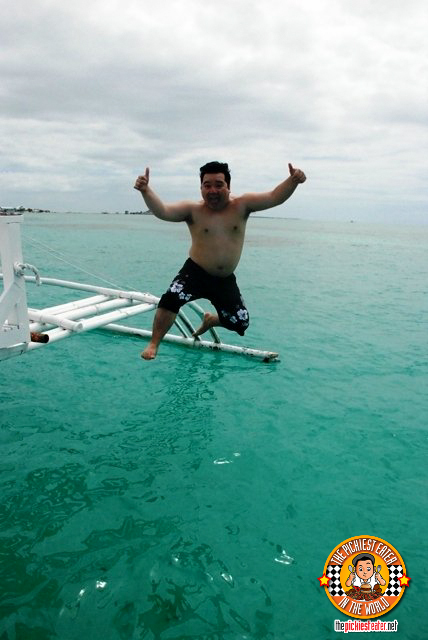 Naturally I led the way, unable to resist doing the traditional leap off the boat that I used to do in my earlier days in Cebu. 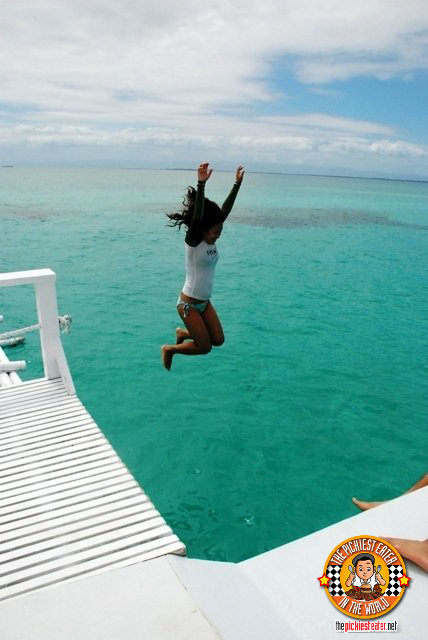 Karen, who said she was deathly afraid of doing the leap, ended up taking the leap herself and enjoying it! I do believe Don's words just seconds before this picture was taken was, "Ayoko tumalon, ayoko tumalon, ayoko tuma-AAAAAAAAYYYYYYY!!!!!!" Afterwards, the boat dropped us off back at Portofino Resort, in which we were staying in. Normally, Islands Banca doesn't do that because the resorts don't allow, but luckily we knew the owner hehe..
Perhaps the greatest decision I made as the designated Tour Guide was choosing to go on the Islands Banca Cruise, instead of using the traditional pump boat. This made experience of island hopping new even for ME. It looks like a traditional pump boat from afar, but the moment you climb aboard, you'll see and feel the difference. There are different packages you can choose from that would best fit your needs, but we basically choose the package for the boat only, and we brought our own food. Booking was done through email, and their customer service is a delight to work with, responding in a timely fashion and in clear and concise manner. Please check out their website at http://www.islandsbanca.com for booking inquiries. you should try it michy! 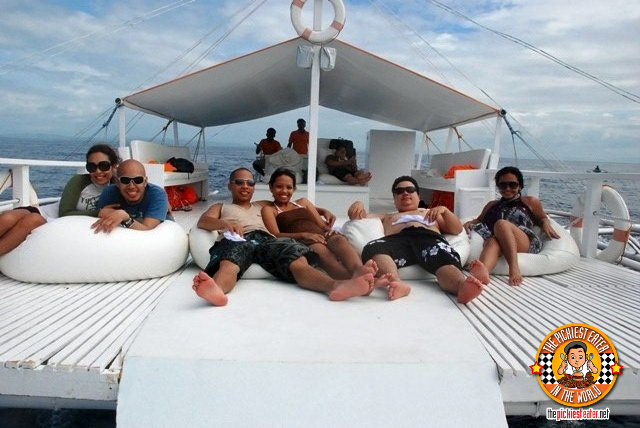 I'll be going back to Cebu too, but on September pa.. :) Hopefully I get to try the Islands Banca cruise. I miss going to the beach! The article you wrote just showed how amazing your dad is. A lot of people don't know him well because he just walk the talk while staying humble. I am so lucky because I know him well and benefited from his good character.Like your Tita Celia, he is one in a million. My friends said they had a great time here! Too bad I had to go home a day earlier they went to the place. Boooooo! Sayang!! You should try it.. we really had a blast! haha true story yun, Irene!! 4 of us from Thailand will visit Cebu next week. 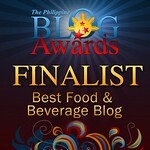 It's good to see your blog first. Really helpful. Wonderful to hear that Benz! Hope you guys enjoy! !